“So what’s the point in talking about it?” he persisted, albeit less belligerently. “Like knowing what?” the young man asked. “But I thought that part of the brain was nonconscious,” he said. Laughing, I clicked through a series of PowerPoint slides showing the three functional layers. They are combined in the drawing on the left and separated in the one on the right for easier viewing. Then I handed out a summary list of key components, explaining that each layer contributes distinct functions, although all layers interact at some level, as well. According to Joseph Chilton Pearce in his book The Biology of Transcendence (2002), this portion of the brain can take over the physical components of a learned skill, which frees the neocortex to observe and develop ways to improve performance. On its own, the reptilian layer is unable to alter inherited or learned patterns of behavior. Dr. Paul MacLean's recognition of the limbic system as a major functional system in the brain eventually won wide acceptance among neuroscientists. 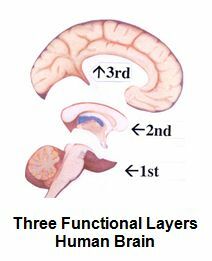 The triune brain model is regarded by some as his most important contribution to the field, even though everything MacLean deduced hasn’t proved out as he envisioned it might. That’s the triune brain in a nutshell. As an aside, Arthur Koestler made the concept of the triune brain the centerpiece of much of his work in The Ghost in the Machine, while English novelist Julian Barnes mentioned the triune brain in the foreword to his 1982 novel Before She Met Me. “Good job; helpful information!” said the young man as he walked toward the door. I figured that was high praise from his brain.